In the Aztec society, animals were considered a vital part of religious and mythological symbolism. They were often used to indicate different gods and the deities who were, in turn, often associated with different animals. At the Templo Mayor in Tenochtitlan, Aztecs sacrificed a wide range of animals to their deities. Usually, the harder it was to catch or hunt an animal that was sacrificed, the greater was considered the esteem of the sacrifice. The Aztec people sacrificed all sorts of animals to their deities. In some cases, animals from remote areas were imported to the city of Tenochtitlan to have them offered to the gods. 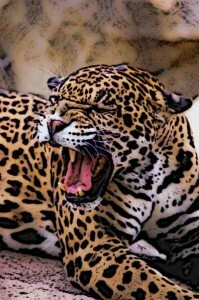 The sacrifice of jaguar, which was considered a powerful religious symbol, was treasured above all animals but it was very rare. Aztecs also sacrificed cats, fish of various sorts, birds such as quail, even insects such as crickets, and snakes. Different species of fish were specially bought from remoter regions to be brought to Tenochtitlan and sacrificed to the gods at Templo Mayor. Mollusks were also a regular offering at such sacrifices. Aztecs had a primarily vegetarian diet for which they relied on their agricultural produce. Yet they also consumed meat, though in scarcer quantities. Aztecs had three key ways of getting their hands on meat. One of them was hunting. Deer, boars, different kinds of birds including migratory ducks and a whole range of other animals were hunted by the Aztecs. The second source of meat was marine animals. The Aztecs Empire soon stretched far enough to have access to the sea. From these remote corners of the Empire, Aztecs supplied the city of Tenochtitlan with different varieties of fish and other marine animals for consumption. The third source was the meat from domestic animals, which included turkeys and the dogs. Archaeologists have found evidence of only two animals having been domesticated by the Aztecs. These include turkeys and dogs. Both of them served a ready source of meat at domestic meals in case of an urgent need, such as at the time of feasts. From turkeys, Aztecs obtained both eggs and meat. The dogs were kept exclusively for meat. In general, Aztecs esteemed the meat of the turkeys above the meat of the dogs. Both kinds of meat were often consumed together. 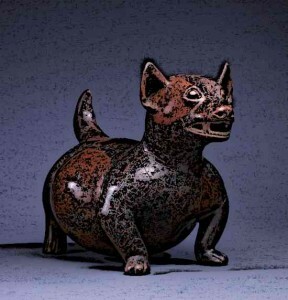 Aztec Dogs Colima, Archaeologists have found evidence of only two animals having been domesticated by the Aztecs. These include turkeys and dogs. Animals enjoy a central position in Aztec symbolism. Nearly every Aztec deity is represented or associated with one or more animals. So for instance, the jaguar was used to symbolise the highest Aztec deities and was worshipped by the Aztecs. Similarly, the rabbit was used to denote the goddess of fertility named Mayahuel. Apart from representing the deities, animals were also used for everyday symbolism and were frequently used on the Aztec calendar. In such uses, a frog denoted joy, monkey was a symbol of festivity and celebration and butterfly was a symbol of transformation. The Eagle was also considered a powerful symbol in Aztec mythology and was associated with the capital city of Tenochtitlan. It also denoted the Sun deity. Much like the symbols for days, states and deities, Aztecs also made use of animals in their mythology, sometimes to refer to fantastic, imaginary creatures. Ahuizotl, for example, is a dog-like creature in Aztec mythology with hands like humans. It had an extra hand at the end of its tail. The feathered serpent, another fantastic creature, was famously associated with the Aztec god Quetzacoatl. Cipactli, in Aztec mythology, was a sea monster who had the appearance of a toad, fish and crocodile combined. The body of the Earth, Aztecs believed, was created from Cipactli. Aztecs also held that when the moon was first born, it was too bright and so, one of the gods threw a rabbit in its face to dull the glow and make it bearable for the Earth. Aztecs made extensive use of the motif of different animals in their artwork. This is the reason why archaeologists have been able to recover a large number of Aztec figurines depicting a large variety of animals. Among the figures, painting, frescoes and murals from the Aztec Empire that have survived over history, depictions of snakes, deer, fish, birds, jaguars and other animals can be found. Feathers of birds were highly esteemed as a piece of art and Aztec nobles wore them on their large headdresses. 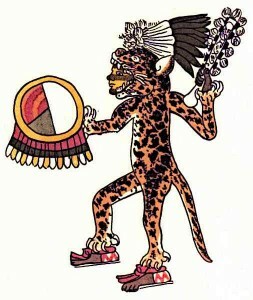 The Jaguar Big Cat was revered by the Aztecs and the Jaguar Aztec Warriors used the skin of a Jaguar as their costumes. Aztecs had different tattoos made on their bodies, believing that these tattoos had religious significance. In these tattoos, different aspects of Aztec deities were often emphasised, usually using animals as the symbols. Aztecs believed that by having these symbols tattooed on their bodies, they could attain some of the characteristics of the corresponding deity. Popular animals used by Aztecs as tattoos included jaguars, frogs, monkeys and eagles. Usually the animal chosen for a tattoo was also considered the totem of that person. So Aztecs had a strong affinity with the tattoos of animals and believed they acquired the abilities of the animal they drew on their body. Monkeys, for instance, served as a totem for a festive spirit, jaguar denoted a brooding and powerful being while eagle was the symbol of power and Sun. Animals had a central importance in Aztec society. As a source of meat, as potent symbols in Aztec mythology, as a kind of sacrifice to the gods and as a source for Aztecs to observe different natural traits, animals were apparently a very interesting subject for the Aztecs. Most of the Aztec deities are represented by one animal or the other and every major episode of the Aztec mythology includes one or more animals, sometimes in favour of the gods and sometimes pitted against them. Some animals such as the jaguar, eagle and snake had a paramount importance in the Aztec religious symbolism and were associated with the most powerful deities. Aztecs also used these animals as subjects for their tattoos which served as their personal animal totems. They believed that having a given animal tattooed on their body, they could attain the powers and abilities of that particular animal.